If you have mechanical aptitude and producing precision metal parts, instruments and tools used in manufacturing sounds appealing, a career as a tool and die maker might be a match. These workers produce devices that enable machines to manufacture many products for home and business use. Tool and die makers must be masters of a variety of machines, due to how quickly technology changes. 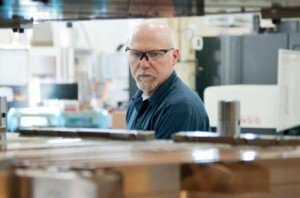 The State of Wisconsin Department of Workforce Development (DWD) describes their main responsibilities as analyzing specifications, laying out metal stock and setting up and operating machine tools. As a tool and die maker, you’ll need to be able to fit and assemble parts required for producing and repairing dies, gauges, fixtures, jigs, gauges and hand tools. You’ll also perform testing and inspection. According to the Bureau of Labor Statistics (BLS), the tool making portion of this occupation consists of crafting precision tools and tool holders for cutting, shaping and forming metal and sometimes other materials. It also includes making jigs, fixtures, gauges and other devices. Die maker responsibilities include constructing dies (metal forms) to shape metal used in stamping and forging. You’ll also produce molds for die casting and for molding ceramics, plastics and other materials. The BLS reports the median hourly rate of tool and die makers in May 2010 as $22.56. Apprentice pay increases with skill level. Projections suggest that the growth rate of tool and die maker jobs between 2010 and 2020 will be essentially flat. Foreign manufacturing competition and automation advances have boosted worker productivity, and employers need fewer workers. However, as individuals retire, the supply of new workers probably won’t completely meet the demand. You can enter this field in several ways: through a formal apprenticeship, local technical instruction or on-the-job training. You’ll need solid math, computer and problem-solving skills. Also important are attention to details, being mechanically inclined and having the ability to understand computerized measuring devices. Tool and die makers need good near vision and arm-hand steadiness. In this job, you’ll often need to work overtime. Wearing protective equipment like safety goggles is necessary because of potential hazards working around machine tools. The apprenticeship includes five years of training. Apprentices complete 10,400 hours of on-the-job training and 576 hours of paid instruction. Some unpaid related training is usually required. You could also take vocational courses to help you land a training slot with a contractor. The National Tooling & Machining Association sponsors training centers and training partnerships with employers located near various chapters. If you didn’t develop computer familiarity, learn to read blueprints or learn how to take and read measurements in high school, you should do so now. Consider shadowing a tool and die worker for a few days to learn about the types of machine tools used. Your next step is deciding whether to apply to an apprentice program or take trade courses locally. Talk to at least a few prospective employers to find out who offers on-the-job training and which apprenticeship programs are open. Many journeyman tool and die makers choose to complete additional training to become supervisors. Others specialize in making a particular product. A number of schools, training facilities and state apprenticeship boards offer certification programs for extra credibility.